It’s a lot for a young body to handle, no matter how great of a student-athlete they are, so our job as parents is to make sure we keep that engine burning efficiently each day. We need to make sure we are putting the right pieces in place to complete the optimal performance puzzle. In part-1 of this educational piece, I covered how to successfully implement high-quality protein and proper hydration into their diet, and how to address sports supplements. In this piece, I will cover the two key energy sources for all humans, Fats & Carbohydrates. As I mentioned in part-1, the goal is to provide a basic understanding of how food best works for us and use basic fundamentals without getting overly scientific. Let’s start with carbohydrates! Carbohydrates are the primary energy source of the body which is what our muscles use as fuel in order to function properly. How the body processes carbohydrates, or “carbs”, depends on their molecular makeup. This is where the distinction of “simple” carbs and “complex” carbs come into play because our bodies digest them at different speeds because of their nutrient profiles. For example, “simple” carbs are made up of monosaccharides (glucose, fructose, galactose) and disaccharides (maltose, lactose, sucrose). “Complex” carbs are formed when three or more glucose molecules are combined. Here is an easy way to understand carbs — think FIBER, not carbs! Understand that there is a significant difference between white bread and whole grain high fiber bread; a sugar-coated cereal and oatmeal; French fries vs. sweet potatoes. The focus should be on the quality of carbohydrates. Remember in part-1 I said that breakfast is a primary meal not to be skipped, and good protein sources should be a major part of that meal. Quality carbohydrates are a must in breakfast also. When putting meals together you want to consider how much fiber a meal can provide. A good breakfast may be Greek yogurt as your protein, whole grain bread or oatmeal with some fresh fruit for the nutrients and fiber. Fruits and vegetables are an important source of carbs for a high-performance athlete, but we know that kids don’t always like or choose these foods. So, we have to be diligent in our effort to create new eating habits for them. To put that effort into perspective, Dr. Laura Edwards-Leeper who is a staff psychologist at Boston Children’s Hospital says, that it can take up to ten times to determine if a child really dislikes a food because their taste buds change so much. This plate shows what an ideal meal should look like. As you can see, half of the plate should be fruits and vegetables with a 1/4 being some faster burning starchy carbs sources. The Children’s Hospital of Los Angeles says that athletes who consume 70% of their calories in quality carbohydrates will have the maximal storage of glycogen to fuel the muscles for long performance durations. That is a key statistic to remember because it eliminates the need to “carb load” by eating excess carbohydrates in an effort to increase performance. The body will already have what it needs, so loading won’t be necessary. Don’t be afraid to play around with the quantities and meal timing around activities because everyone digests food differently. The key is to consume as many nutrient-dense carbs as possible, but the timing efficiency depends on the person. Some young athletes can digest quickly and stay energetic and ready to go at all times. 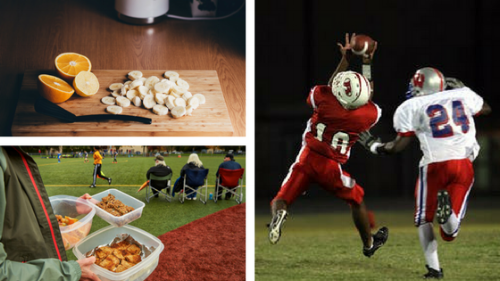 Other athletes may get lethargic for an hour before their body’s blood sugar levels off, so they may need more time if this is a pre-game/pre-practice meal. Data from the American Dietetic Association and American College of Sports Medicine suggests that athletes should be eating 45-65% of their calories from carbohydrates. What that looks like for an athlete would be 2.7-4.5 grams per pound of body weight. This will provide optimal fuel for muscles during demanding activity. For example, an athlete weighing 120lb. should consume 324-540 grams of high-quality carbs. Pre-exercise: 1-2 hours before activity. Meal (or shake) should be higher in carbs, lower in protein & fat. During exercise: While shorter duration activities (<60-min.) don’t require special fueling tactics, longer bouts do. (8-10 ounces of water for every 20-minutes of exercise after an hour). For sessions longer than an hour (>60-min.) the recommendation is about 30-grams of carbohydrates for each hour of training or exercise. High-quality dietary fat is vital for us all, and especially for our growing athlete. Quality fats are key. Scientific studies show that Omega-3 and DHA are crucial in brain development. Fat is the most calorie dense nutrient and should comprise of 20-30% of total caloric intake. The right kind of fat is very important because it can fight inflammation and help with exercise recovery by decreasing soreness in muscle tissue. Making sure that we are obtaining high levels of healthy fats containing Omega-3 fatty acids is the key, and the healthiest sources can be found in a few uncomplicated places, the first being in animal protein. Organic chicken and eggs, grass-fed beef, lamb, and wild-caught fish are excellent sources of Conjugated linoleic acid (CLA) and Omega-3 fatty acids (EPA & DHA). In fact, wild-caught salmon, trout, and catfish offer 19-27% of their total fat in Omega-3s. If you’ve ever wondered why wild-caught fish is better for you rather than the farm-raised versions, the farmed raised offer much higher levels of Omega-6s which increase inflammation in the body. Other great sources are from jars of butter like natural peanut butter and almond butter. Buyer beware as you should read the labels on some brands of jars of butter in order to avoid sugar and hydrogenated oil. You’ve probably seen the peanut butter with the oil floating around at the top, right? Well, that’s the one to choose. Just stir and refrigerate! Most of those don’t have additional additives or fillers. Oils and avocados are two more great ways to add quality fat sources to each meal. But not all oil is made the same. Some are better for cooking, others are better at room temperature because too much heat changes their molecular structure, and then some should be avoided altogether because of how they are produced. Coconut and avocado oils are great to cook with at high heat, while olive oil should not be used to cook with unless you’re baking with it. Dr. Loren Cordain, the author of The Paleo Diet, explains that high polyunsaturated oils (corn, safflower, sunflower, cottonseed, vegetable, and all partially hydrogenated oils) should be avoided because they oxidize easily when heated. That oxidation changes the structure of the oil, which can cause inflammation and may be associated with inflammatory diseases such as arthritis, type 1 diabetes, ulcerative colitis, celiac disease. Lastly, high Omega-3 oils can be added regularly in a supplemental form by way of soft-gel supplement or gummy version made up of fish and krill oils. These are taken with any of the meals and should be stored at low temperature or in the refrigerator once opened to maintain freshness. Putting the pieces together is really easy once you realize that we all should be eating as much earth grown, minimally processed foods as we can throughout the day. Variety is key for our young athletes and the more fruits and vegetables each day, the better. This ensures the “think fiber, not carbs” approach to meal planning. As our kids get older they may be faced with peer pressure to “get big and ripped”. Fat burner supplements are marketed as a way to help get them “ripped” faster. For example, ephedra claims to help with weight loss, improve strength, speed, and endurance, increases alertness, and mask fatigue. The reality is that fat burners are useless and even dangerous. They may provide some strength improvements in endurance athletes, like cyclists, but only when combined with caffeine, which is dangerous for any athlete. Some side effects include irritability, headache, anxiety, tachycardia, arrhythmias, heat stroke, acute renal failure, rhabdomyolysis myocardial infarction, stroke, and seizures. Ephedra is also banned by the NCAA, USOC, and all major leagues. Clearly, not recommended for our youth athletes! If you apply some basic principles, then chances are, your child will be set up to succeed to the best of their ability. Our athletes are using their bodies as a machine and we need to make sure that machine is always running on good fuel. If you have a high-octane engine in the car you drive, you know that putting low-grade gasoline in it will do some damage to the engine at some point. Think of the human body the same way. Best of luck to your athletes!